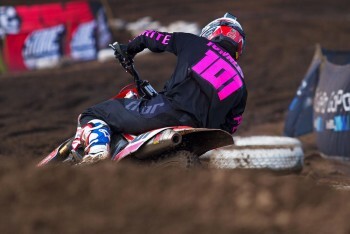 Part-timer Townley takes convincing Coolum round victory. Kirk Gibbs clinched the 2015 MX Nationals MX1 championship for the KTM Motocross Racing Team in moto one this afternoon at Coolum, his third place sealing the number one plate with a moto to spare. It was an entertaining battle for victory throughout the moto; much of it led by Gibbs’ teammate Luke Styke (KTM Motocross Racing Team) before former world champion Ben Townley (Penrite Honda Racing) clawed his way to the front in the latter stages. Once Townley hit the front he wasn’t headed, winning by 2.5s over the KTM combination of Styke and Gibbs. Fourth was a quiet ride from pole-setter Kade Mosig (CDR Yamaha), pressuring the podium finishers but unable to make up an early deficit. Adam Monea (NPS Monster Energy Kawasaki) was forced to climb through the pack for fifth, beating home Daniel Reardon (CDR Yamaha), Lawson Bopping (Peter Stevens DPH Yamaha), Dylan Long (NPS Monster Energy Kawasaki), Ross Beaton (Peter Stevens DPH Yamaha) and Hamish Harwood (KTM). Notable non-finishers were Egan Mastin (Team Motul Suzuki) after he ran inside the top five early on and Cody Cooper (Penrite Honda Racing). The final moto of the season belonged to Monea in a ride that moved him up to third in the standings, crossing the line three seconds ahead of Townley, who got his first overall of the year on a part-time schedule. In third – and helping teammate Monea’s cause in the process – was Long, leading home Bopping, who was actually third on track prior to a 10-second penalty for course-cutting, and Styke. Sixth was good enough for Mosig to seal the runner-up in the standings, from newly-crowned champion Gibbs, Mastin, Harwood and Reardon. The overall results saw Townley on top over Monea and Styke, while in championship terms it was Gibbs 61 points ahead of Mosig and Monea, who got the final rostrum position on countback over Styke. 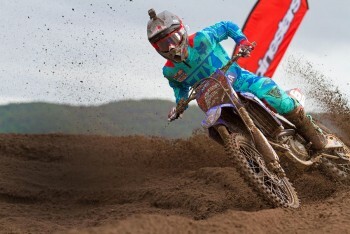 JCR Yamaha rider unstoppable as MX Nationals series concludes. JCR Yamaha’s Jay Wilson dominated the final round of the 2015 MX Nationals MX2 Championship at Coolum today, taking a 1-1 result to clinch the crown. A vital opening moto MX2 victory set red plate holder Wilson up for his first national title this afternoon after sprinting away from the field over the 30-minute duration. Wilson increased his advantage to 24 points with just one moto remaining for the season, holding reigning champion Luke Clout (Serco Yamaha) at bay by near five seconds crossing the line. In third was Nathan Crawford (Husqvarna) ahead of Caleb Ward (KTM), while Jed Beaton (Serco Yamaha) had a consistent ride for fifth. Western Australian Dean Porter (KTM) impressed in sixth, while Geran Stapleton (Wilson MX Penrite Honda), Takeshi Katsuya (Sony Action Cam Kawasaki) and Alex Morris (Proformance Kawasaki) completed the top 10. Front-running KTM privateer Dylan Wills exited under the observation of RACESAFE after leading early, and it was also disappointment for Kyle Webster (SFC Racing Yamaha) who was forced out with an empty fuel tank in the closing moments. Wilson put an exclamation mark on his incredible MX2 title win in moto two this afternoon, claiming the title via his second moto victory of the round – earning his second-career overall on consecutive weekends in the process. He won the moto by near nine seconds over Crawford and Beaton, who capped his year off with a strong performance. Ward was fourth in the moto for the second time today, as Wade Hunter (Yamaha) rebounded in moto two for fifth. Positions six to 10 were made up of Stapleton, Porter, Ricky Latimer (Yamaha), Morris and Tomas Ravenhorst (Yamaha). Meanwhile Clout put up a strong fight to lead laps, the end result in the year’s final moto was 13th. Overall it was Wilson the dominant winner from rookie duo Crawford and Beaton, while in the championship Wilson wound up with a 41-point advantage over Clout and Katsuya, who was 10th overall today.